It was just a mere 180 years ago on this day that some Michigan delegates met in Ann Arbor to finally cede claim to a strip of land called the "Toledo Strip" to help Michigan gain statehood. The backstory: Ohio was already a state at this point and Michigan so badly wanted to become one (unfortunately). Michigan wanted the Toledo Strip because of it's proximity to Lake Erie — it was super resourceful and would be good for the economy. Ohio also wanted it. Some poor map drawing put the Strip into question of which had the legitimate claim. 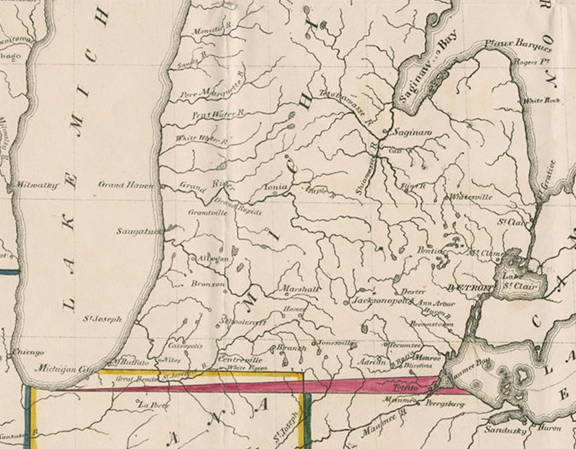 When Michigan tried to become a state in 1833, Ohio said that they had to clearly define the border, which to Ohio meant not including the Toledo Strip. Neither side wanted to give in and the ensuing, continued disagreement led to militias from both states to occupy the space. Enter: the Toledo War (that no one died in). Fast forward to 1836 and Congress offered Michigan a compromise. Ohio gets the Toledo strip and Michigan gets the Western part of the Upper Peninsula (they already had the Eastern portion). At the time it seemed like an awful trade because the U.P. was just a vast wilderness of nothing. One could argue that it still is, but it turns out, mass mineral deposits were found in the U.P., there was a ton of wood to be used during the logging boom, and it became a place of travel due to the views and sights. This has been your obscure history update of the day.